Teardrop flags are a great way to attract attention for your business. Teardrop flags, also called teardrop banners, are a mainstay at most outdoor events around Perth. They have become extremely popular in the last ten years for one main reason: they work. Whether you are a corporation or a small business, teardrop banners are an inexpensive, effective way to attract customers. Compare teardrop flags to other forms of advertising. Media advertisements have to be repeated on a regular basis to do any good. Worse yet, you pay for advertising impressions to people who aren’t in your target market and have no need for your product. Newspaper ads, magazine ads, television or radio: they are all hit and miss. And they cost a lot of money. Meanwhile, teardrop flags cost less than one average media buy and they last for years. You can use them in front of a fixed business or you can use them at events. You can literally take them everywhere you promote your business. At ImagePak Marketing, we have teardrop banners available in six different shapes and three different sizes. They can be printed to any colour and you can have any design. With full colour printing, photos are OK, too. A small flag is 2.5m tall, a medium flag is 3.5m tall and a large flag is 4.5m tall. 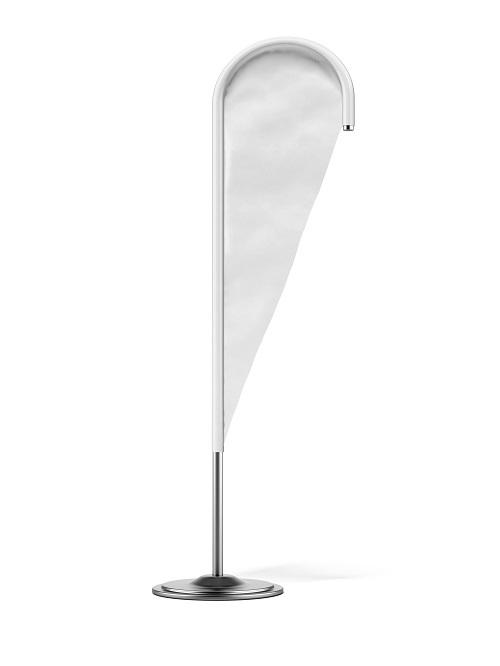 In addition, teardrop flags are manufactured in a way that they will flap loudly in the wind. This makes them impossible to ignore and forces passers-by to look at them in curiosity. When they look, they will see your company name, logo and any photo or message you want them to see. They will see it in whatever colour you want them to see. We usually recommend bright colours to make them grab even more attention. To learn more about our attention grabbing teardrop flags, call ImagePak Marketing today: (08) 92444 111.